Stacey created this layout using lots of Wood Veneer products from the Dear Lizzy collection Polka Dot Party. She decided to cover the pieces in the Wow Chunky gold glitter. She also covered the banner piece with the White Chunky glitter to break up from the gold. Stacey thought these pieces where really fun to work with as they were quite large in size and bigger than your usual wood veneer. She even managed to sneak in a wooden clip. Project Life pocket pages are such a fun way to scrapbook events and trips, with so many small pieces there is a chance to use all sorts of details and embellishments. Danielle enjoyed adding various wood veneer die cuts from BasicGrey’s Carte Postale range to her two project life pages about a recent trip to Hobart with her son. The travel motifs suited the theme well, and there were some wooden elements - such as the polaroid style frame and the outlined speech bubbles - that were easy to use pretty much anywhere! Stamps are a perennial favourite for all types of crafting… scrapbook layouts, cardmaking and mixed media. Check out some gorgeous projects from our design team. October for Iris is just about the perfect month to start making hand-made gifts and projects for Christmas. This is also the perfect time to start working on next year’s planner. Iris shares with us an organizer she created using the Snap album system. The cover was embellished with American Craft’s Amy Tangerine products but to add detail, Iris used stamps from Tim Holtz Stamper’s Anonymous cling sets. The inner dividers were also stamped and embossed with Distress Embossing Powder. Card making with stamps is so much fun! As well as providing you with a central/main image for your card stamps also allow you to add detail, create unique embellishments and transform papers by adding texture and patterns. It’s this second use of stamps that Leanne has drawn upon to create her “Designing with Stamps” card series. Leanne has created this first Christmas themed card using a die and stamp set that were originally designed to make banners. By flipping the image Leanne has created these cute Christmas trees. The wreath on this card has been created using a mixture of stamped and punched pieces. Initially Leanne stamped the wreath onto the cardstock with both white and brown ink, then she added some punched branch pieces to give the wreath added dimension. This tag was created mainly with cardstock and Leanne used the stamps from the soon to be released AC Peppermint Express - Wondermint stamp set to create the patterned background by randomly stamping the snowflake in distress ink. She then gave each snowflake and the edge of the tag a dusting with glitter glue. Jill has turned the Prima Sunset range into a 12" x 12" canvas. Inspired by the name of the range, Jill has taken words from a song of the same name from the film Fiddler on the Roof. She has used the Sunrise Sunset #1 stamp as the centre of her sunflower embossed in black ink and repeated the stamp at the top and bottom of the lyrics to subtly carry on the theme. We’d love to see your very own take on using ephemera, die cuts or tags on your projects, whether it’s a card, a Project Life-style pocket page or a traditional scrapbook layout or even a beyond the page or mixed media project. Please just make sure you use Aussie Scrap Source suppliers in your work! Email a picture of your entry to aussiedt@iinet.net.au with a note about any techniques and a brief materials lists to be in the running to win a fabulous prize pack of some of the featured products by next Sunday 20th October. Below are some inspiring projects from our design team using fab packs of die cuts and ephemera in fun ways. Stacey created these cute canvases using the Glitz collection Finnley. The motifs out of the Whatnots pack were perfect for this set. Stacey added some mixed media techniques and colour matched the papers. She loved the alphabet sheet and thinks this set would look great in a kids playroom or nursery. Stacey also created a layout featuring the Finnley Collection. She used the Emphera from the Bits and Pieces set. The Up and Coming piece was a great match for the theme of her layout. Louise has created 2 layouts which have used both the 'what nots' die cuts and stickers. The die cuts and Sticker die cuts a just the perfect embellishment and photo as they draw the eye immediately to the photo. The design of these die cuts are is very now and on trend and give your layout just that perfect visual wow factor. The best thing about the Fancy Pants Designs What a Wonderful Day Ephemera Pack is that you get a multitude of images and sentiments that compliment each other and which are suited for a male or female. Jane usually spreads all the pieces on her work area then starts placing them together to see what comes up! Layering them on top of one another using mounting tape gives the card dimension and fills out an area nicely! It really is a quick and easy way to make cards! Congratulations to Tarrah McLean this week for her gorgeous ‘Happiness’ page! On the 'Enjoy the Journey' layout, I have used mostly My Minds Eye products and on the 'Family Love' layout I have mostly used American Crafts Amy Tan products. I have used a mix of My Minds Eyes Brads, Basic Grey buttons and Teresa Collins dots to fill my heart shape. Other items used: My Minds Eye patterned paper and chipboard sticker. Ribbon. Buttons have been a favourite of mine for a long time so it was fun to rummage through my stash and create this layout using some long forgotten paper and lots of buttons. A simple design but colourful. Remember you have until Sunday night to send in images of your own projects using our buttons, brads and dots… see here for all the details. In the meantime, we have some design team inspiration for you! Danielle featured buttons, brads and pearls in this sweet and light layout about herself and her daughter. She added some extra circular motifs using stickers and embellishments from Crate Paper's Close Knit range, scattering the assortment of details in a seemingly random way around the page. The Bella Blvd button combo is particularly gorgeous, with some lovely wooden buttons included, and they complement the pretty oversized brads which have been used as dot points for each word in Danielle's layout title. Stacey created this sweet set of cards using Studio Calico Collection Atlantic. The brads from the collection were a great centre feature for each of the bows. The colours of the My Minds Eye Enamel dots also worked perfectly together. She placed these around her embellishments which also tied in with the paint flickers. Jill has used impasto medium to create texture on the front of this gorgeous white journal before rubbing distress inks all over it. Using a Cropadile, she has punched holes through the opening cover of the book and added the Aussie Scrap Source (amber) brads to give it a little sparkle. Inside the journal, Jill has used a selection of the Homestead papers on the right hand opening of each page. Dots, buttons and brads have been staples of scrapbooking since the beginning when we all got excited about coloured brads! Now there’s endless variety and they can make a great finishing touch to a project, or even be the main feature. We’d love to see your very own take on using dots, brads and buttons on your projects, whether it’s a card, a Project Life-style pocket page or a traditional scrapbook layout or even a beyond the page or mixed media project. Please just make sure you use Aussie Scrap Source suppliers in your work! Email a picture of your entry to aussiedt@iinet.net.au with a note about any techniques and a brief materials lists to be in the running to win a fabulous prize pack of some of the featured products by next Sunday 13th October. Below are some inspiring projects from our suppliers design teams using brads, buttons and dots in fun ways. Celine Navarro created this fun page for Basic Grey using the Carte Postale collection, including their mixed brads and Wooden Buttons. They add the perfect playful interest to an area of white space to balance her layout perfectly. Sometimes less is more as Tonya Dirk shows here using the new My Mind’s Eye Cut & Paste collection. A single button sets off a heart, a single large brad makes the inner circle of the ‘O"’ in Wow, a few dots accent the strip of chevrons. As if this layout wasn’t stunning enough, Heather Leopard added sunshine yellow buttons to her sunrays to add to the playful feel of this page. She has used October Afternoon’s gorgeous Summertime collection. And of course because they’re flat, buttons, brads and dots are perfect to incorporate into pocket page scrapbooking. Here Heather has used the bright colours as accents to October Afternoon’s Daily Flash collection, and outlined them in pen to give them an extra oomph. You can see more of Heather Leopards wonderful work here. The October Afternoon blog is full of inspiration. Here Roree Rumph created a sketch and this beautiful card from several different collections. Laura Craigie added her interpretation with the above fun card, cutting holes in Midway patterned paper and filling them with buttons and brads. Finally some inspiration from Webster’s Pages, and DT member Nina Ostermann using the Recorded collection. The Chipboard Buttons even come with co-ordinating twine colours! Dies and punches, always popular amongst cardmakers in particular for their easy batch-making versatility, are picking up in popularity again amongst scrapbookers as the Project Life scrapbooking system grows, looking for flatter solutions for their pocket pages. There are a multitude of new dies and punches instore, from the beautifully simple versatile shapes to breathtakingly intricate. We have two suppliers of gorgeous new die shapes to introduce to you this week – Elizabeth Craft Designs and Cottage Cutz. Leanne Whitby demos a few of the new designs below. We’d love to see your very own take on using dies and punches on your projects, whether it’s a card, a Project Life-style pocket page or a traditional scrapbook layout or even a beyond the page or mixed media project. Please just make sure you use Aussie Scrap Source suppliers in your work! Email a picture of your entry to aussiedt@iinet.net.au with a note about any techniques and a brief materials lists to be in the running to win a fabulous prize pack of some of the featured products by next Sunday 6th October. Below are some inspiring projects from our design team using some of our beautiful punches and dies in fun and unique ways. Card making is so much more fun when you can create your own embellishments that perfectly co-ordinate with the papers you are working with and dies are the first thing Leanne heads for when doing this. For this card Leanne used a number of dies which is one of the advantages of die cutting – you can mix and match the dies to make your own unique elements. In addition to using dies with cardstock and patterned paper Leanne also finds they are great for cutting velvet paper, fabric and felt. This card features one of the new CottageCutz dies which Aussie Scrap Source are now stocking. CottageCutz are thin metal dies and they can be used with popular die-cutting machines. CottageCutz dies have been designed to cut all sorts of paper types from thin printer paper to thick cardstock, adhesive backed paper, vinyl and vellum. the dies can deliver more force and may cut additional materials such as lightweight chipboard (such as cereal box thickness), cork, craft foam, thin metal / metallic paper, and very stiff/thin specialty fabrics. For this card Leanne cut the feature tag from fabric and cardstock and then she adhered them together. Stamping onto the fabric first she then finished off the tag with leaves cut from velvet paper and some cardstock flowers made with Elizabeth Craft Design layered flower dies teamed up with Tim Holtz Tattered Florals die. The tools in the Sizzix Susan’s Garden Tool Kit make sculpting and moulding the petals of the flowers really easy. This card features one of the CottageCutz border dies. Leanne used the border die to add some intricate detail to the card front. Leanne found by using the CottageCutz Universal Metal Shim Plate with the border die the die cut cleanly and smoothly as the perfect amount of cutting pressure was achieved. She has also used Eyelet insert tag upside down so the detail remains a feature. This card features some more of the new CottageCutz dies. Here Leanne created a pocket for the front of the card which has a tag inside. She then embellished the pocket with some of the co-ordinating tags, additional die cut elements using Sizzix Framelit and Tattered Florals dies together with hand cut fishtail banners. Leanne took advantage of the tiny sizing of one of the new Elizabeth Crafts Designs dies to create of this tiny framed butterfly OTP project. Here she cut two of the top layers of the butterfly and mounted them on the hearts. The tiny sentiment was perfect to personalise the project. You can see more of Leanne’s work with Elizabeth Crafts dies in our weekend inspiration post on Friday. Punches are such a go to tool/product when you what to give your project that extra wow factor. For this layout Louise has used the fabulous Martha Stewart layering punch to create 2 difference types of star shapes out of vellum, which adds an extra simple touch of visual texture! Iris Uy considers punches and dies as among one of the best investments she has made in terms of building her tool collection for scrapbooking. Iris loves lots of hand-cur patterns and die-cuts in her pages. But when she is handed a collection pack with both patterned papers and solid sheets, she takes out her punches and dies to make good use of the solid sheets. In this layout, Iris shows us how to make gorgeous edge borders for scrapbook pages using the EK Success Rose Bush Edge Punch. Thanks again to those who contributed to our reader’s challenge this week. Congratulations to Joanne Richardson who wins this week’s prize pack for her fabulous interactive page – we love how she has used journaling cards to create pockets for even more photos and hidden journaling! A great page from Natalie Elphinstone. She wrote: I recently made this layout using the journal cards from the new Carta Bella Hello Again collection. The cards are great for writing your journaling on of course, but they're also just fabulous embellishments! Robyn Wood writes… This week I chose to use two of the 3” x 4” journaling cards from Snap Studio by Simple Stories. I selected three floral wood embellishments by Prima and painted them with Silks paint in plumeria. 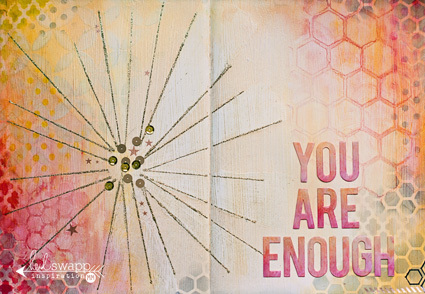 White adhesive pearls and a word from Tim Holtz Chitchat stickers finish this simple card. I think it took all of 10 minutes to create! Tarra McLean used Elle’s Studio journalling cards for this supercute layout. And created this one using Amy Tan/American crafts products. We love how she incorporated journalling cards as you would patterned paper to create this clean and graphic pages. This weeks challenge is 3x4, 4x6 and other sized journaling cards, and we’d love YOU to join in and share your pages, cards and other projects with us. Though they might be designed for pocket pages, we think they have much more potential than that! You can read all the details of the challenge here. In the meantime, here’s some inspo for you! So many scrapbooking manufacturers are designing gorgeous papers designed to be used in Project Life albums. Sue Tonga loves these 'divided card' papers and shows how you can also use them to create beautiful scrapbooking pages. Sue has used the "Hello Again" collection from Carta Bella to scrap this page featuring 6 photos. Sue chose the journaling cards paper from the collection to use as the basis for her design. Sue simply trimmed the paper into the journaling cards and decided which ones worked best for her layout. The great thing about the papers is that they are double-sided so if you don't like one side, you can use the other. Sue simply needed to trim the cards by 1/4 inch to allow them to fit across her 12x12 page. Scrapbooking in this style is a great way to feature multiple photos. Kim has used the Project Life style divided page protectors and journaling cards to scrap a recent holiday to Queensland. Kim comments how pleased she was just how quickly the project came together using this method. Kim has used a variety of sized cards in a variety of ways whilst scrapping her holiday. In the first Project Life style layout she has used a 3x4 card simply for journaling. In the second layout she has used a combination of different cards – 2 of the die cut cards from the Simply Sotires Say Cheese range as embellishments, and a 3x4 inch journaling card. In the third layout, Kim has used several pre-printed cards as embellishments and a 4x6 inch journaling card. In the fourth layout, Kim has used two 3x3 inch pre-printed card, using one for a title, and a 3x4 inch journaling card. In the fifth layout, Kim has split a pre-printed 4x6 inch card over 2 3x4 inch pockets and added some journaling to it. In the sixth layout, Kim has used a 6x12 printed panel and then layered a 4x6 inch card, which she has trimmed down, and a 3x4 inch card onto this panel to create an embellishment cluster. For the final layout, Kim created a traditional 12x12 inch layout but used the journaling cards to create the base of the embellishment cluster to the right of the photo. Lastly we thank Leanne Allinson for allowing us to share this gorgeous vibrant spread that she has created using a fun mix of photos and Bella Blvd journal cards and embellishments. This week we’re looking at journaling cards, which have seen a definite resurgence in popularly with the rise of Project Life and pocket page memory keeping. Not just for divided pages though, journaling cards work perfectly on traditional scrapbooking pages as well as cards and even mixed media projects. We’d love to see your very own take on using 3x4, 4x6 and other sized journaling cards on your projects, whether it’s a card, a Project Life-style pocket page or a traditional scrapbook layout or even a beyond the page project. Please just make sure you use Aussie Scrap Source suppliers in your projects! Email a picture of your entry to aussiedt@iinet.net.au with a note about any techniques and a brief materials lists to be in the running to win a fabulous prize pack of some of the featured products by next Sunday 22nd September. Below are some inspiring projects from some of our brands’ design teams using journaling cards in fun and unique ways. Amy Heller from the October Afternoon DT designed this page using the Daily Flash – Snapshots collection. We love how she has segmented her page into vertical columns of colour, like a journaling card and photograph rainbow! In this innovative page Vivian Masket has actually printed a collage grid from her photos, and then clustered the journaling cards from the Daily Flash Snapshots line below, to create the embellishment. Carta Bella Designer Jen Chapin created this layout using the Hello Again collection and Echo Park Photo Freedom Designer Photo Sleeves. We love how she has used both the journaling caards and her photos to handwrite her journalling on. She also shares a tutorial on how she put this page together which you can find here. Check out this fun vacation page by Diane Payne for Bella Boulevard. She has used the Daily Details papers, which are inspired by the Project Life concept but as you can see work wonderfully with traditional scrapbook pages too. Journaling cards and frames can also help structure a page without the divided page protectors as shown in this super cute page by Jenny Evans using the Snapshots collection. We look forward to seeing what you can do with journalling cards in this week’s challenge! Thanks to all our readers who have sent in breathtaking projects this week. We congratulate Candy Chelepy as this weeks winner for this beautiful page full of texture and interest! Metal embellishments have always been very popular in scrapbooking but they’re trending again now. Leeann decided to take a different approach with this one. She wanted to show off some of the quirky pieces you can get and display them in a 7 gypsies printer tray. First she painted the tray white and then gave it sand. Each square has been filled by using the Shimmerz sheets, which she embossed for extra texture. Then it was a case of finding all the metal treasures and arranging them in place. Once she was happy with the design it was time to glue in place. All it needed now was a few pops of colour. Flowers and metal are of course old favourites for creating interesting and textural pages. Beautiful flowers might just take the cake as being one of the most addictive embellishments, and metals are a staple that can add just the right touch of polished finish. We’d love to see your very own take on using flowers and metals on your projects, whether it’s a card, a Project Life-style pocket page or a traditional scrapbook layout or even a beyond the page project. Please just make sure you use Aussie Scrap Source suppliers in your projects! Email a picture of your entry to aussiedt@iinet.net.au with a note about any techniques and a rough materials lists to be in the running to win a fabulous prize pack of some of the featured products by next Sunday 15th September. Check out some of our favourite flower and metal products and projects from some of our brands design teams below to inspire you and of course we’ll be back on Wednesday with more jaw-dropping inspiration from our own designers. How about this beautiful altered canvas by Juliana Michaels from the Bo Bunny design team. She rightly points out that creating an altered canvas is a great way to use up leftover or extra supplies. For more details on how to create this gorgeous canvas, you can check out her blog here. Gabrielle Pollacco from the Bo Bunny design team has created this beautiful layout with prodigious use of flowers and some of the gorgeous trinkets alongside The Avenues collection. BasicGrey’s Metal Flair buttons give this page by BG design team member Sophie Crespy the perfect finishing touch. You can see her whole double layout on their blog here. Gorgeous use of Ornate Metal Keys and a binder ring on the cover of this fabulous Steampunk Spells halloween album by Annette Green for Graphic45. She has created a tutorial for it which you can find here. If you don’t want the bulk of flowers you can always fussy cut them from patterned paper as the talented Romy Veul has done here using the ‘A Ladie’s Diary’ collection from Graphic45. She has adhered them with foam tape and added pearl dots to create some depth. Of course there are times when only the real thing will do and then you can’t go past the variety of colours and flower types that Prima offers. This breathtaking layout is by Lene Bjornerud and combines the beautiful pastel Delight collection with an utter plethora of assorted flowers. There’s even a gessoed metal key in there.. can you spot it?! Prima Educator Limor Webber has created these three mixed media cards using Prima’s Everyday Vintage collection and there’s a comprehensive video tutorial on the Prima Channel where you can watch and create these cards alongside her. We hope that brings you inspiration to get started on this weeks challenge! We’ll be back tomorrow with more from our design team! We loved this weeks entries for our Designing With… challenge and this week it was all about washi tapes, glitter tapes, vellum tapes. Thanks to everyone who sent a project in, we really enjoy seeing and sharing them. Congratulations this week to Judith Armstrong for her lovely clean layout! And stand by for this weeks challenge! I decided to tear up my paper and add some washi tape and make some texture on the background I then used gesso watered down and white washed the page. I then matted my photo and placed on page and added flowers and used a prima crackle mask and put more texture on my page. Hope you enjoy my page as much as I enjoyed creating it. Margaret Walz has used Prima products for her layout (including resist canvas lettering, papers, flowers and resin) and Washi Tapes from Tim Holtz and Prima. She writes that she loves to rough up her layouts and always tries to use flowers. We love the tones of the ones she has used on this page. Judith Armstrong has used washi tape from My Minds Eye, Glitz Design and Queen and Co in her layout. She writes: I used strips of washi instead of patterned paper. I adhered washi to cardstock to enable me to border punch. I covered some cardstock with strips of washi tape, coated it with some matt medium to make sure it was well glued down and once it was dry, hexagons were. The diecut piece will be perfect to use as a stencil as well! Sue doesn't do the traditional style of project life pages but she loves the idea of creating 'quick' pages for events, such as Christmas. Sue has used the beautiful Santa's List collection from Teresa Collins to create her two page spread, using washi tape and the chipboard set to add her embellishments. You may notice that Sue used the glittered notecards 12x12 paper from the collection but the other papers have come from the 6x6 pad, which is lovely, as the patterns are miniature versions. To create the striped embellishment on her left page, Sue covered a piece of card stock in washi tape, then die-cut it using her Big Shot machine. She then stitched in silver thread to add interest. Washi tape is lovely for adding pops of colour and pattern on to your pages and is so easy to work with. And if you haven't already realised, collecting those beautiful rolls of decorative tape can be addictive!! Washi tapes have been trending for a little while now. There are endless patterns and colours available and are a great thickness to create a trim on any project. Stacey has used the coordinating tapes from the new My Minds Eye Cut and Paste Collection to create lots of fun elements on her page. Using a piece of string she created a banner with the Washi tape and adhered using foam tape to add extra dimension. She also made a super quick bow and added a button in the centre. A simple trim at the top of the page or even to cover a wood clip.........the possibilities with Washi Tape are endless. Leanne loves washi, gaffer and glitter tapes as they are some of the most versatile and fun elements to add to a paper crafting project. It is so easy to use and once you have a collection started it is so easy to grab a co-ordinating tape to match the papers you have selected. Here Leanne has made a card featuring MME Washi Tape and Carta Bella papers. Leanne has used the washi tape to attach the layers of her card to the card base. Washi tape is so easy to pleat and just tear and stick! Leanne has also used washi tape to create the embellishments on the card. By covering white cardstock and then cutting or punching it Leanne creates perfectly co-ordinated fishtail banners and a heart. Gaffer tape is thicker than the washi tape making it a perfect element to add to a male card. Here Leanne used the gaffer tape in three different ways. Firstly she used it to create a fish tail banner piece. Then she used it to transform an everyday office bulldog clip into a co-ordinated embellishment and lastly she adhered it to paper and created this handpieced arrow. For this off the page project Leanne used a combination of glitter tape and washi tape to create a gift within a gift. This cute little box is full of handmade tags, covered pegs and wrapping twine that the recipient can use when they next have to give a gift. Because the tapes are already adhesive they are perfect for covering anything you can think of really. Here Leanne used the tapes to cover pegs. The tape was also great to use to dress up some wrapping twine. Leanne simple wrapped the tape around the twine randomly and then trimmed the pieces. The bow on the top of the box was made with glitter tape. Leanne used it like ribbon initially to form the centre of the bow and did not remove the backing, then she used the built in adhesive to finish off the other components. Like the main card Leanne used washi tape and cardstock to create embellishments for this tag. Here Leanne used washi tape to join two components of the tag together. This tag features washi tape used in a multitude of ways. In addition to using it to add banners and borders, cover buttons and punch shapes, Leanne also repurposed the stems of her flowers and added washi tape to create these matching feathers. Glitter tape was punched, cut and also used to cover a button on this tag. Washi tapes, glitter tapes are a fun way to brighten up any project quickly and simply and they are the focus of this week’s readers challenge. Cluster them, layer them, use them as decorative elements or to actually stick your photos down! Washi tape comes in almost as many colours and patterns as coloured paper these days, and warning… they can become addictive! We’d love to see your very own take on using washi, vellum or glitter tapes on your projects, whether it’s a card, a Project Life-style pocket page or a traditional scrapbook layout or even a beyond the page project. Please just make sure you use Aussie Scrap Source suppliers in your projects! Email a picture of your entry to aussiedt@iinet.net.au with a note about any techniques and a rough materials lists to be in the running to win a fabulous prize pack of some of the featured products by next Sunday 8th September. Check out some of our tape products and projects from some of our favourite brands below to inspire you and of course we’ll be back on Wednesday with more jaw-dropping inspiration from our own design team. October Afternoon have a super cute range of washi tapes, that both work with their patterned paper collections and individually. This cool idea by October Afternoon Design Team member Vivian Masket turns them into super quick flags on a toothpick for this gorgeous card. The talented Mou Saha incorporates them in three different ways on this stunning art journal page, including using them to cover a polaroid frame, and layering them to form an accent cluster. Roree Rumph never fails to amaze with her beautiful card designs, and on this one she has used washi tape to create a frame around her card, as well as to make the flower petals. She notes that she dusted them with talcum powder to remove the stickiness and then looped and layered the strips. It probably smells awesome too! Tina Walker from the My Minds Eye Design team has created this gorgeous framed project using the MME Find Your Wings and Fly collection. She has used washi tape to create the frame inside the frame. You can find a tutorial for this project on the MME blog here. Missy Whidden is new to the My Minds Eye Design Team but she’s clearly no stranger to their decorative tape products! We love how she has incorporated them to reinforce the horizontal design of this stunning layout. American Crafts has a massive range of glitter tapes as well as washi and ribbons which have been combined so beautifully by their Guest Designer Becki Adams to create an eyecatching background for this gorgeous page. Chin Pooi turned American Crafts tape into gorgeous little blooms to adorn cards and layouts. She has even provided a tutorial on how to do this on the AC Blog here. Bella Blvd designer Malika Kelly was inspired by a Pinterest link to create this fun layout using Bella Blvd Designer Tapes as a background for her monograms. You can read how she did this here. Finally, Jennifer McGuire shows us how to use washi tape as a masking tool, rather than as a product on her cards. She shows a useful video tutorial on the Studio Calico blog here. We’ve had a huge reader response this week to this challenge! There are some amazing projects here and we thank you all heaps for taking the time to join in. Congratulations this week to Maria Featon for this gorgeous mixed media project. We love her use of texture to create depth and light – you almost feel like you could fall into this canvas! Check back soon to find out this week’s Designing With… challenge!! Here’s our Design Team’s instalment bringing you inspiration on using stencils, masks and sprays. Check our last post here to see how you can win a prize pack of brand new CHA products just by joining in our challenge! For this extraordinary layout Louise has used a combination of mediums with this wonderful new release Prima mask by Finnabair. To begin with Louise has used a clear impasto with the mask to create a dimensional bubble pattern on the background. To highlight this pattern has applied 3 layers of paint/mist. First layer was a an application of the Luminarte Silks paint, which once applied was spritzed with water to create a subtle silver coloured layer. The second layer was with the Heidi Swapp Tinsel Color Shine mist. This was also spritzed with water and allowed to dribble down the page. Once all medium layers were dry Louise completed the layout and then added extra coordinating colour splats with the Tattered Angels Chalkboard glimmer mist. Stencils and mists are a great way to add texture and color to layouts. Iris likes to turn to stencils every time she needs to make layouts that will focus a certain paper line that is more on the graphic and simple style. Jill has used her Studio Calico Masks on the codex book she has created. On the cover she has used repetition of the small butterfly to give it a worn them. On the inside signatures that have been bound with string, you can see that Jill has highlighted the butterfly motif on the cover of each signature. Designing with… a Reader’s Challenge! This week for our reader’s challenge we’re looking at stencils and masks, and of course the sprays that you need to bring them alive on your pages, cards, and projects. Stencils and masks are a great way to add your own signature and style to a page without necessarily requiring any illustrative talents and you can create some great effects by mixing colours and layering stencils with stamps, rubons, texture pasts and lots of other mediums. and of course the beauty of stencils as a great investment is that they can be used over and over and by varying the colours and textures you use them with you can create so many different looks. We’d love to see your very own takes on using stencils, masks and sprays on your projects, whether it’s a card, a Project Life-style pocket page or a traditional scrapbook layout or even a beyond the page project. Email a picture of your entry to aussiedt@iinet.net.au to be in the running to win a fabulous prize pack of some of the featured products below by next Sunday 1st September. There are amazing new (and old!) releases from Studio Calico, Heidi Swapp, Prima, Little Yellow Bicycle and Jillibean Soup, as well as The Crafter’s Workshop, and you’ll find showcased below heaps of inspiration, tutorials and fabulous examples of projects from our suppliers. Maggie Massie from the Heidi Swapp Media Team has created this stunning page using a selection of Heidi Swapp products including the Lattice and Honeycomb Stencils, and Mustard, Sweet Cherry and Primrose Color Shine sprays. She has layered the stencils and the depth of colour from her sprays to create depth and texture on this inspirational project. And how about this fabulous page by Heidi Swapp Media Team member Kim Jeffress? She has combined the Polka Dot stencil and sprays with patterned paper to create a custom page all her own. It’s busy, it combines lots of photographs, layers and journaling and yet it still all comes together to draw the eye to the main focal point. Liz Kartchner shares techniques using watercolours and Mister Huey’s on the Studio Calico blog blog to create a customised look on Project Life-style pages here. And how about this beautiful page by Wilna Fustenberg from the Studio Calico Creative Team. She has used a mask and wet medium to create this gorgeous resist technique and even includes a video tutorial here. New masks and stencils from Prima are fabulous versatile and combined with their mixed media releases you can create some amazing project, like this one from Prima Design Team member Keren Tamir. You can also see a video tutorial of her creating this page here. Jillibean Soup Placemats are cool because you can use them as stencils or actually on your projects to add depth and texture. Summer Fullerton has created this fun and playful page using the Jillibean Soup White Circles Placemat and layered patterned paper circles underneath. Above are two examples using the Lattice Placemats on cards. They help to create interesting texture and depth to any special project. Nicole Nowasad shares how she created this homely page using the Hexagon Placemat in a video tutorial here. Finally we leave you with some examples of both stencils and sprays from the very talented Fancy Pants design team. We hope this inspires you – we’ll be back with some of our own design team projects tomorrow – we’d love you to join in our challenge and get misting! We thank our following readers for participating in our first Designing With … challenge, for these beautiful projects using stickers and/or chalkboard products from our suppliers. Ruth Bonner – using Simple Stories ‘I love Summer’ line. Congratulations to Robyn Wood as the prize pack winner of this first challenge – we love how she stamped and even coloured directly onto the Chalkboard sticker!